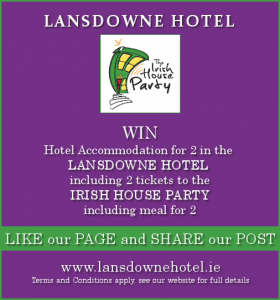 In 2015, The Irish House Party nestled in the comfort and welcome of The Lansdowne Hotel, Dublin, launch the revival of traditional Irish music and dance in all its glory. Gone are the big blasts and fads of the Riverdance era and its substitutes, and returned are the soft furnishings, and cosy surrounds of a Traditional Irish House Party. The Irish House Party Bar partnership with The Lansdowne Hotel offer a high standard of hospitality and present guests with an ambiance that is both welcoming and traditional, in the finest sense of the word traditional, the glowing charm of soft tones and traditional furnishings make the Irish House Party and Lansdowne Hotel a unique home from home experience. The Irish House Party musicians and dancers, coupled with The Lansdowne Team are professional, courteous and offer all that is so often lost in our once famous Cead Mile Failte. As dozens of guests fill out the famous Druid’s restaurant, the air fills with an aroma of traditional Irish food, fresh Dublin produce tickles at the nostrils, while pints of Guinness are served at the perfect temperature and smooth white head. The food is of the highest standard and would sit easily on the menu of Dublin’s finest Restaurants. While the Irish House Party offers a night of all things Irish, the wine connoisseur will not to be disappointed, with The Lansdowne serving such suburb choices as Tocornal Sauvignon Blanc and Tocornal Cabernet Sauvignon, just to mention two. And what would an Irish night be without Murphy’s Irish Stout, Murphy’s Red Ale, Beamish Irish Stout and so forth, all of which combine to make a great meal, a world class experience. Following food, drink and banter in Druid’s Restaurant and The famous Den Bar, The Irish House Party bring back all that is genuine about The Irish Cultural experience. The Lansdowne Hotel does echo with the haunting sounds of hundreds of years of all that is good about Irish Culture and Tradition, music and song are not only played but explained, instruments are not a mystery but visualisations used to explain their time and place in our long rich history. Three hundred year old tunes, that made Leonardo De Caprio and Kate Winslet famous in the great epic Titanic, captured the hand and foot stamping mood of the guests gathered, Bono and U2 echo from the traditional instruments as easily as the lyrics written by 1916 Patriot and Irish hero Padraig Pearse. A session with the Irish House Party is as much about music appreciation as it is about concert and performance; time is taken to explain the instruments, the songs, the dance and the music. The dancers step up causally and periodically, to perform what can only be described as dancing Gymnastics, the dancers remind the audience, that one does not have to be on a big stage with multi-million Euro backing sets to perform and transcend the very essence of Irish Dance. Following rapturous applause from the guests gathered, many from America, New Zealand, our own Fair City and other parts of the world it is time to return to the Irish House Party Bar banter in The Den Bar where yet more musicians had gather to beat out a crescendo of tunes that see even the most restrained, foot-tapping, hand clapping and singing along with the memories stoked by a timeless echo of ancient tradition. The Irish House Party has returned Irish music, dance and culture to its true home, that is home is The Lansdowne Hotel which has been home to true Irish tradition for decades, The Irish House Party, above all else offers guests a truly traditional experience, that experience is captured in the ambiance, the food, the service, the passion, and most importantly a true Cead Mile Failte has been returned to the Irish session by world class musicians and dancers.